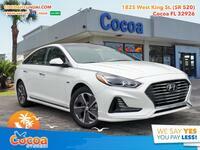 Perhaps the most popular vehicle on the Hyundai lineup is the Sonata, but for those drivers who would like even more fuel efficiency than what the Sonata has to offer, we also provide the 2017 Hyundai Sonata Hybrid in Cocoa FL. Offering the same exquisite style and suite of features as the traditional Sonata Sedan, the Sonata Hybrid adds a hybrid powertrain that enhances fuel efficiency, thus saving both the environment and your bank account. Next year, the Sonata will be receiving a big mid-generation facelift, and we imagine the Sonata Hybrid will as well. But for now, the 2017 Sonata Hybrid offers an excellent option to environmentally- (and wallet-) conscious shoppers in the area. Interested in a 2017 Hyundai Sonata Hybrid? The table just above takes a look at some of the key specs & features available or standard in the 2017 Hyundai Sonata Hybrid, but we thought we’d dive a bit deeper into what this hybrid sedan has to offer to give you an even better idea of what makes it such a great option. For starters, we thought we’d delve into the hybrid powertrain. As the table depicts, the Sonata Hybrid is powered by a 2.0L 4-cylinder engine that generates 193 horsepower. What it doesn’t mention, however, is the engine’s fuel efficiency. In the regular Sonata Sedan, the SE trim level is powered by an engine that achieves 29 miles per gallon combined. But the Sonata Hybrid SE generates 42 mpg combined, which is broken down to 39 mpg through city streets and 45 mpg on the highway. The higher trim levels, including the Sonata Plug-in Hybrid, offer slightly different fuel economy ratings, but the base Sonata Hybrid achieves 42 mpg. With the excellent combination of 42 mpg and 193 horsepower, the 2017 Hyundai Sonata Hybrid makes an excellent midsize sedan option for those drivers interested in efficiency but whom don’t want to sacrifice power. If you think you might be interested in one of these hybrid sedans of your own, be sure to schedule a test drive here on our website.